India has put in place a formidable structure for major elements of maritime domain awareness (MDA) in areas of its immediate interest however; in my opinion should be the aspiration of the Indian Navy to acquire formidable sea denial and sea control capabilities. It is opined that the terms Sea watch/denial/ control are likely to expand and transform in to ‘Oceanic space watch/ denial/control’. 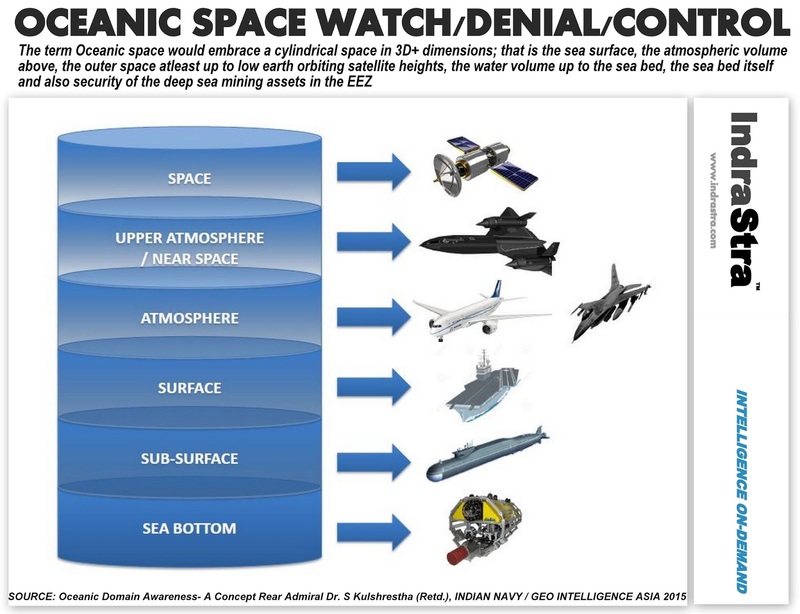 The term Oceanic space denial/control would embrace a cylindrical space in 3D+ dimensions; that is the sea surface, the atmospheric volume above, the outer space at least up to low earth orbiting satellite heights, the water volume up to the sea bed, the sea bed itself and also security of the deep sea mining assets in the EEZ. The above premise implies that a broader oceanic horizon is inclusive of not only extensive and broader spatial operating arena, but also much wider and broader foray in to the verticals below the surface to the sea bed and above up to periphery of the atmosphere. Unless implications of this nature are anticipated and factored in, technological forecasts themselves would trail behind the rapid advancing pace of technology and the synergies being achieved due to harmonization and adaptation inter and intra scientific fields. Therefore, it is imperative that holistic perspectives into the ‘information consciousness’ arena include the oceanic domain awareness as well as it’s connect with India’s security and MDA. Scientific study of the oceans originated in U.S. essentially as a function of national security. Investigations that focused on the tactical and operational impacts of the fluid, geophysical, chemical and biological marine environment upon U.S. Navy operations successfully addressed many challenging naval requirements; but oceanographic inquiry in support of naval needs also triggered unexpected results. In many instances, the knowledge of the oceans that was acquired through directed studies - and through complementary lines of inquiry that were enabled by tools developed for naval oceanographic research - further affected national security in ways that were not anticipated and which transcended tactical and operational significance and could be considered of more strategic consequence. The primary impetus to the rapid development of oceanography during its 20th century days as a science is without a doubt the submarine and the fundamental changes that occurred when naval warfare became truly three-dimensional. Prosecuting submarines was feasible principally through the transmission of underwater sound, actively by sonar to echo-locate targets and passively by listening hydrophones and triangulation. The scope of oceanographic efforts in the pursuit of the submarine opened all of the oceanographic disciplines (physical, chemical, biological, and geological oceanography) to increased investment, research effort and importantly to integration. Twentieth-century oceanography was fundamentally a security-based endeavor to reduce the opacity of the oceans to antisubmarine warfare in WWI, WWII and the Cold War, and harness that opacity for offensive submarine operations, along with a host of other security based naval concerns. Fundamental progress in basic knowledge of the ocean sciences has occurred due to advances in sensor technologies. Understanding of plate tectonics and sea floor spreading was discovered during large-scale mapping of the sea floor after the World War II. This led to the revamping of theories of evolution and structure of the earth. Subsequently, the investigation of mid-ocean ridges carried out by submersibles and towed deep sea vehicles led to detection of many unknown forms of life in the hydrothermal vents and microbes below the seabed at great depths. In the past Ocean geologists, physicists, biologists, and chemists, have used an array of tools, from deep-sea drilling to instrumented buoys, to improve their understanding of role the ocean plays in controlling longer-term climate change and weather. -Availability of new sensors which can be placed and report upon chemical, biological and physical characteristics. -Advances in computers and software that has enabled storing, retrieving and manipulating large volumes of sensor data. Real time data is available to large number of research communities for interpretation, modelling, simulation and prediction. -Advances in telecommunications through undersea cables and satellites allowing real time control of sea based sensors and transmission of bulky sensor data. Technologies (e.g., robust sensors and infrastructure, autonomous vehicles) need to be developed to enhance data collection in all weather conditions to support high-spatial resolution and near-real-time forecasting throughout the Open Ocean and coastal zone. Providing accurate and comprehensive environmental information will require expanding observational networks to monitor, record, and present real-time, surface-monitoring data (e.g., high-frequency, coastal-based radars). This expansion will require advancing sensor and technology development, particularly for autonomous and persistent observations, as well as for long-term observing systems; expanding real-time or near-real-time data collection on environmental variables by incorporating observational capabilities of crafts of opportunity (e.g., fishing, cargo, and passenger vessels); and enhancing automated and autonomous bottom-mapping capabilities for change detection to improve rapid, full-scale survey scheduling. Data collected by the observing systems must be accessible through a comprehensive national data network, either through a single system or a distributed network. Developing this data network will require new methodologies that address gaps in data collection, sharing, and interoperability of technologies, and should permit integration of existing research into operational systems (e.g., systems providing real-time navigation data to vessels). This data network should be able to link with other databases, such as those focusing on ecosystem data, and developed in accordance with international standards for data exchange. The national data network will also provide the data needed for models simulating multiple scenarios to better understand potential impacts, weather events or man-made disruptions on marine operations, and to support operations restoration plans. The coast and open ocean are critical domains for the security of a nation with sea as boundaries, both at home and abroad. National-security operations in the ocean take place globally and often require continuous, near-real-time monitoring of environmental conditions using tools such as autonomous sensors, targeted observations, and adaptive modelling. These capabilities, combined with improved understanding of the ocean environment enabled by other ocean science research activities, will support accurate ocean-state assessments ‘and allow future forces to conduct joint and combined operations in near shore and deep-ocean operating environments, anywhere and at anytime’. The differentiating aspects between MDA and ODA need recapitulating. The MDA focuses upon the maritime security environment specific to naval operations; the ODA focuses upon the overarching oceanic environment. Both are technology intensive and require sophisticated sensors and computational capabilities. MDA has tactical, regional and strategic components whereas the ODA is strategic knowledge based architecture. Both require elaborate data and information fusing interface with myriad of interconnected agencies. The MDA primarily needing vast inputs from commercial, intelligence and security agencies and the ODA from advanced research, academic and scientific communities. 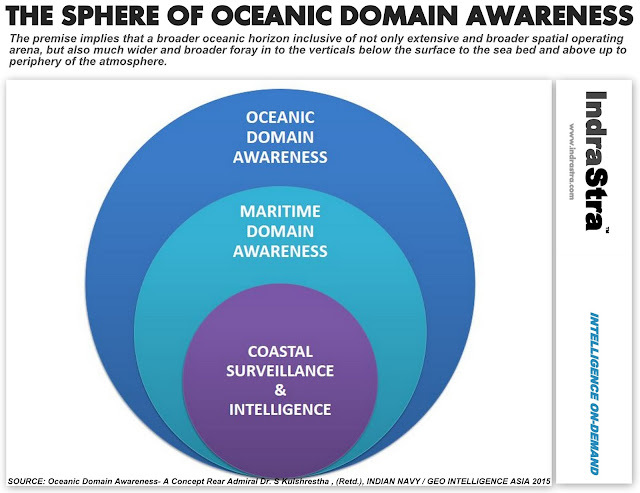 In view of the above, it can be appreciated that the MDA needs to be integrated within oceanic domain awareness for completeness of maritime knowledge, the lack of which can lead to serious consequences. This has been reflected in a recent assessment of naval exercises and weapon firings in the US, where it was found that over 90% of them were affected adversely due to imperfectly assessed or little known environmental factors. In an actual conflict, these would have led to mission failures. This along with the sinking of HMS Bounty ( a fifty year old replica of the 18th century square rigger HMS Bounty) due to the hurricane Sandy when it was 160 miles away from the eye of the storm, off North Carolina, only under-pins the gaps in oceanic knowledge that need to be bridged and fact that Oceanic Domain Awareness is an enabler for the future and an ‘imperative’ for a nation like India. Kulshrestha, Sanatan. "Aircraft Developing a Concept of Oceanic Domain Awareness for India by Dr. S. Kulshrestha (Retd. ), INDIAN NAVY" IndraStra Global 01, no. 06 (2015): JUNE-19. 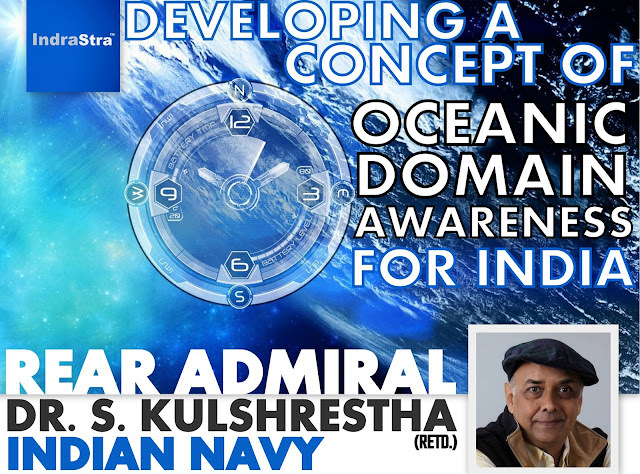 http://www.indrastra.com/2015/06/FEATURED-Developing-Concept-of-Oceanic-Domain-Awareness-for-India-by-Rear-Admiral-Dr-S-Kulshrestha-Retd-INDIAN-NAVY.html.